A twenty-year franchise for the exclusive right to supply water and electricity for lighting to the town of Sault Ste. Marie was granted to Francis Hector Clergue and it was on October 9, 1894 that Clergue’s Tagona Water and Light Company was incorporated. The first order of business for Clergue was to lay down four miles of water pipe and supply 100 hydrants, with construction to be completed by October 1, 1895. Though the franchise proved profitable for the Tagona Water and Light Company, there was growing dissatisfaction among the citizens of Sault Ste. Marie and Steelton Township concerning the company’s service. In 1901 the town threatened to cancel the company’s franchise due to the quality of water that was being provided and again during the summer of 1912 when an outbreak of typhoid in the city was traced back to the failure of Tagona Water and Lights’ chlorine plant. June 12, 1913 the Tagona Water and Light Company advised the City that it would not seek renewal of its water franchise. Later that year on November 22nd, in light of the Mayor and Council’s intent to take over the operations, Tagona Water and Light Company withdrew its application for the renewal of the light franchise. In May of 1914, a provincial arbitrator set the value of the company at $454,981.26 to be paid within six months of the takeover date of October 1, 1914. The award was confirmed by an act of the Provincial Legislature in 1915 and the company surrendered its charter on August 4th of that year. Once again the water and light services for Sault Ste. Marie were owned by its citizens. The new public utility was first operated through the City’s Water and Light Department. The utility continued to operate out of the Tagona Water and Lights’ old office at 807 Queen Street East with many of the same employees. A bylaw regarding the formation of a public utilities commission was put to the people during the municipal election of January 1, 1917 and was passed with a vote of 520 for and 291 against. The city’s water supply dominated the business of the Commission. The city’s water was drawn from the power canal with an emergency connection to the ship canal. Its pumping station was located in the power house of Great Lakes Power. In a report presented to the council in 1917, the quality of the water taken from the power and the ship canals deemed unsatisfactory with the need of the “generous use of hypochlorite of lime” added for sterilization. Dredging operations as well as contamination from shipping and industry were identified in the report as potential hazards to the water supply. The report studied several possible water schemes concluding that, although “Gros Cap will doubtless be the place where the ultimate water scheme will be located”, it was financially impractical at this time. In July 1918, Council approved to construct a combined pump station and electric substation at Huron Street. The new Huron Street pump house contained six electric water pumps – three for domestic use and three for fire. Two additional deep wells were to be drilled to augment the Steelton water supply. It’s worth noting is that at the time of the amalgamation in 1918, the Sault’s water supply was heavily chlorinated and residents of Steelton found its taste objectionable. The Public Utilities Commission of Sault Ste. Marie operated two independent waterworks systems. 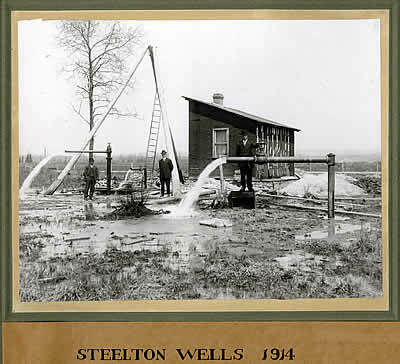 One supplied the main sector of the city with water from the river and the other supplied Steelton and Korah Townships with water from Steelton’s artisan wells. Drilling for two new wells began on the spring of 1952 on the corner of Goulais Avenue and Second Line. Effective April 25, 1960, the Public Utilities Commission announced that water rates would increase for the first time since 1942. The increase was not drastic but necessary to finance the expansion and improvement of the system. The Public Utilities Commission had been urging customers to change to a metered water system for some time and in June 1956 a bylaw was passed making it unlawful for the Commission to supply water to any building without a meter. In April of 1963, construction of the reservoir on Second Line was completed. The reservoir was supplied from the pumping station at Huron and Queen Streets and an elevated water tank on Second Line at Old Garden River Road was completed in the fall of 1967. Expansion of the Commission’s deep wells was seen as a viable alternative. In 1968, the wells at Goulais Avenue and Second Line which had been capped in 1952 were put into operation. The Commission’s third deep well pumping station, first to be located in the east end, was put into service in 1973 along with second east end pumping station, located on Lorna Drive, to be added to the Commission’s water system in 1977. In June 1981, City Council and the Commission came to an agreement that Sault Ste. Marie’s future water supply would be drawn from Gros Cap. The new water intake extends 860 meters into the St. Mary’s River and stands in about 17 meters of water at Gros Cap. From there it is pumped to the two holding tanks on Marshall Drive where the water circulates through two identical holding tanks. The raw water then travels by gravity through an underground concrete pressure pipe to the filtration plant. After being filtered, the treated water leaves the plant and travels 8 kilometers to the city’s existing distribution system. The construction of a water reservoir on Peoples Road north of Fourth Line was completed in June 1991 made the landmark water tower at Second Line and Old Garden River Road, obsolete. The Commission’s four deep well pumping stations together with the filtered water from Gros Cap are estimated to be able to adequately supply the city’s water needs.